A Dole Whip A Day: Pin Trading at Disneyland! We love to pin trade! How about you? For anyone who hasn't done it before, when you're in Disneyland or Disney World, watch for Cast Members wearing lanyards. They'll either have the traditional kind you wear around your neck, or one that hangs more like a bag and displays pins at the hip. You can also find pin boards on counters in the stores. When you find them, you're welcome to trade any of your pins (as long as they don't already have it on their lanyard) for any of theirs! Sometimes the cast members really don't have anything you'll want, but sometimes you can find something really amazing. 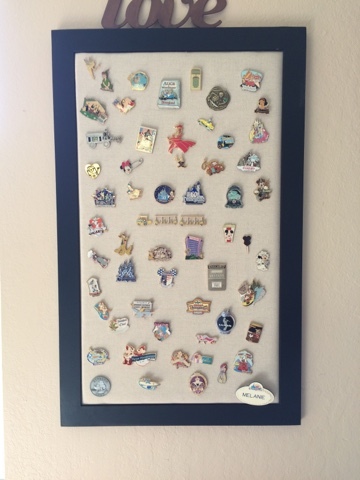 On my last trip to Disneyland, I wanted my kids to try their hand at pin trading, just to change things up. You can find lanyards with little pin sets in the parks or at the Disney Store online. I didn't know if they'd be interested and they already have lanyards, so I opted to buy a set of pins for cheaper on eBay. If you're looking to keep any of the pins, I wouldn't recommend buying this way. You don't get a choice of what pins you'll be getting and some of them were kind of duds. But they're perfect for trading! If you see a Cast Member with a blue lanyard, they'll only trade with kids. My guys had a lot of fun searching them out and knowing that it was ONLY for them. If you display your pins on a board at home like I do, keep the backs somewhere so that you can still trade those pins. Cast Members won't trade for a pin that isn't closed. There are SO many different kinds of pins available. Personally, I like ones that are Disneyland specific and that's what I'm always on the lookout for. Some people like specific characters, holiday pins, special or limited releases... the options are endless and it'll help guide you when you're hunting for something new. 5. There's an App for That! Dole Whip A Day friend Brian has created a great pin trading app! Its called Pinja and its free in the Apple app store (its currently for iPhone users only, but he's working on making it available for Android soon!). 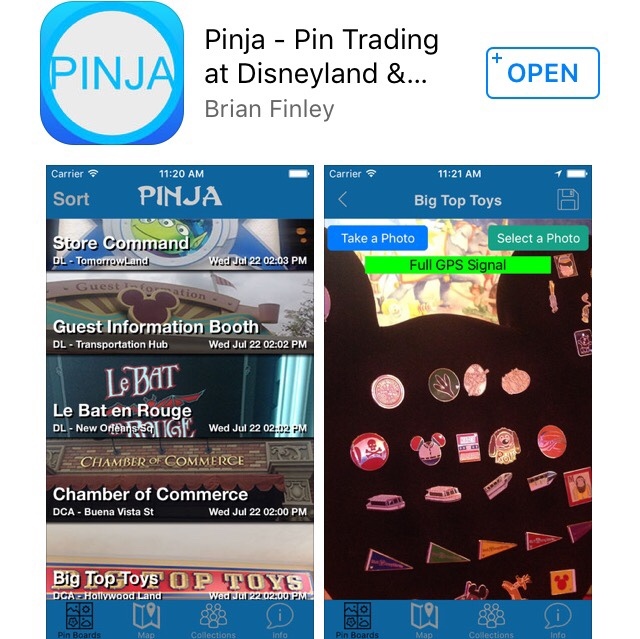 Users can go to different pin trading locations throughout Disneyland and Disney World and see photos of the pin boards available there. This is perfect if you're on the hunt for something specific and don't want to spend your whole day searching. It's user updated though, so if you have/get the app, be sure to help keep the pin photos updated! There's also a section for trading pins (you can post and view pictures of pins up for trade), and you can allow your location to be shared if you're in the park and want to trade with other users. This is an unusual story but since we're talking pin trading, I thought this would be the best time to share! Back when I was a Cast Member (like a million years ago! ), I was working at the pin cart down at the end of Main Street. 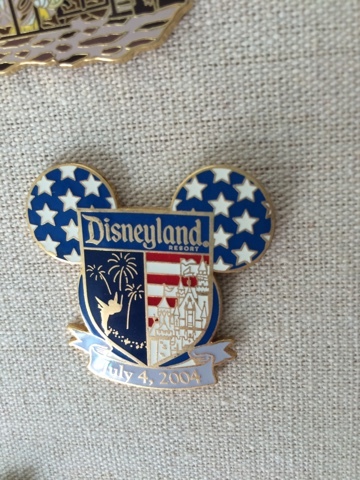 It was just a couple days after the 4th of July and I was wearing the special pin that Cast Members all got for working the holiday. Someone came up and was VERY interested in trading for the 4th of July pin! I was wearing the pin, not the other Cast Member I was working with that day. But the guy seemed very uncomfortable talking to me. He started asking the other CM (who happens to be male) if he has a 4th of July pin too because he had something great to trade for it. He ONLY wanted to talk about it where I couldn't really hear. So, of course, I piped up. "I like pin trading! What do you have?" After some hesitation and my insistence I could handle a pin, he finally let me in. He had a (UNOFFICIAL) pin of Tinkerbell...not wearing anything!!! It had to have been the funniest thing I've ever seen, and I finally understood why he didn't necessarily want to discuss it with a 20 year old girl! I have to say I was tempted, but decided to stick with my Cast Member pin. The other CM, though...I guess I'll never know for sure. lol that was cool. The fact he wanted to trade something truly different and hinting of things sexual but not overly so. I don't collect pins, but Tink...that one and another I found of her that looks like a vintage "tease" book seems rad as heck!